Carondelet Health Network's commitment to the good health of Southern Arizona began in 1880 with a special ministry of the Sisters of St. Joseph of Carondelet. Today, we continue to fulfill our mission of compassionate care. Our system is built on a foundation of values that permeate our organization, extending to the one-on-one care administered in our hospitals. Through this commitment, we bring hope and healing to the communities we serve. In turn, these communities offer the perfect setting to inspire your life away from work. Known for its sunny climate, Tucson is a place where you can enjoy first-class cultural amenities, diverse lifestyle options, world-class dining and entertainment, and unlimited outdoor recreation. We are looking for hard-working, customer-focused professionals. 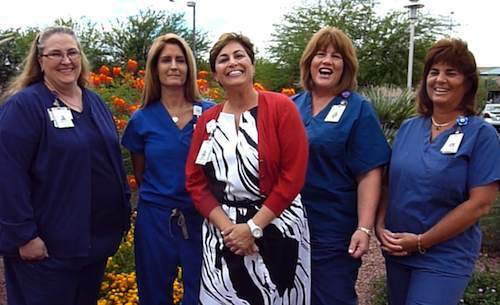 Accreditation Nurse Specialists facilitate the development, implementation, evaluation, and improvement of the survey readiness program, activities, and services for designated organizational divisions and business units to integrate the program with the operative mission of Carondelet Health Network. They serve in a leadership role in facilitating and coordinating regulatory initiatives, readiness teams and processes. Knowledge of project management, regulatory, accreditation, and licensing standards and requirements in healthcare field. Holy Cross Hospital and Carondelet Heart & Vascular Institute . For more information and opportunities, see Carondelet Health Network. Thank you for your interest in this opportunity. Someone from Carondelet Health Network will be contacting you shortly.